Addison’s disease, or adrenal insufficiency, is a rare hormonal disorder of the adrenal glands that affects around 8,400 people in the UK. 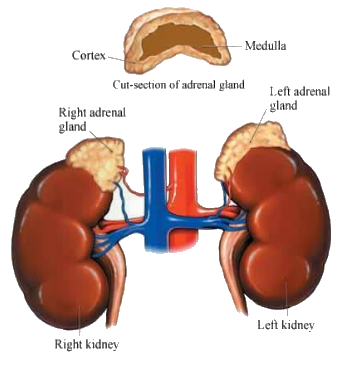 The adrenal glands are about the size of a pea and perched on top of the kidneys, and affect the body’s production of the hormones cortisol and sometimes aldosterone. When someone suffers from adrenal insufficiency, those glands aren’t producing a sufficient amount of these hormones. This can have a detrimental effect on someone’s health and well-being. But because the symptoms are similar to a host of other conditions, Addison’s disease can prove tough to isolate. According to advice provided by the NHS, the symptoms in the early stages of Addison’s disease, which affects both men and women, are gradual and easy to misread as they’re similar to many other conditions. People can experience severe fatigue, muscle weakness, low moods, loss of appetite, unintentional weight loss, low blood pressure, nausea, vomiting and salt craving. “Symptoms are often misread or ignored until a relatively minor infection leads to an abnormally long convalescence, which prompts an investigation,” says Professor Wiebke Arlt from the Centre for Endocrinology, Diabetes & Metabolism at the University of Birmingham. If Addison’s disease is left untreated, the level of hormones produced by the adrenal gland will gradually decrease in the body. This will cause symptoms to get progressively worse and eventually lead to a potentially life-threatening situation called an adrenal, or Addisonian, crisis. Signs include severe dehydration; pale, cold, clammy skin; rapid, shallow breathing; extreme sleepiness; severe vomiting and diarrhoea. If left untreated, it can prove fatal, so the patient should be admitted to hospital as an emergency. To understand the disorder, it’s important to get to grips with the basics and that means understanding what the adrenal glands are – and so to the science. “Adrenal glands have an inner core (known as the medulla) surrounded by an outer shell (known as the cortex) ,” explains Arlt. The inner medulla produces adrenaline, the ‘fight or flight’ stress hormone. While the absence of this does not cause the disease, the cortex is more critical. “It produces the steroid hormones that are essential for life: cortisol and aldosterone,” he adds. The disorder occurs if the adrenal glands are destroyed, absent or unable to function and failure of the glands themselves is known as primary adrenal insufficiency. “It’s most often caused by autoimmune disease where the body’s immune system mounts an attack against its own adrenal glands,” explains Arlt. Another important cause is any disease affecting the pituitary gland, which is located behind the nose at the bottom of the brain. “The pituitary is the master gland that tells the other glands in the body what to do,” continues Arlt. “The pituitary gland produces a hormone called ACTH (adrenocorticotropic hormone to give it its full name), which travels in the blood stream to the adrenal glands. But in most cases, aldosterone is still produced, which means that people suffering from secondary adrenal insufficiency have fewer problems than those with primary adrenal insufficiency. Due to the ambiguous nature of the symptoms, a Short Synacthen Test (SST) needs to be performed in order to diagnose adrenal insufficiency. If someone has been conclusively diagnosed with adrenal insufficiency, they should receive adrenal hormone replacement therapy as advised by an endocrinologist, a doctor specialising in hormone-related diseases. “A normal adrenal gland does not need supplements to function properly and there is no recognised medical condition called ‘adrenal fatigue’,” warns Arlt. So if in doubt, don’t self-diagnose but book an appointment with your GP. For more information, visit Addison’s Disease Self-Help Group (www.addisons.org.uk) or Pituitary Foundation.